Head to one of the world’s great skiing wonderlands in the ski season but don’t actually ski? Why would you? Well, it seems that in common with many other mature winter-sports markets around the western world, perfect powder is no longer enough, and more and more of us seek winter holidays that offer other activities besides skiing or boarding. 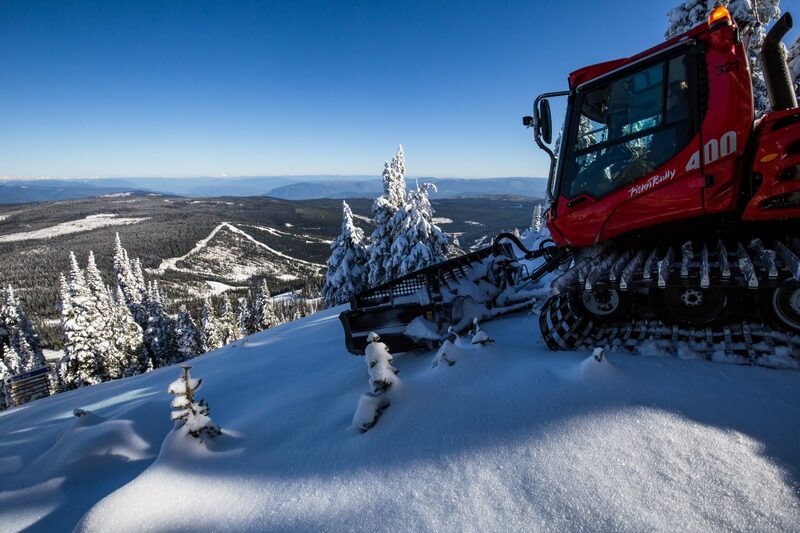 And being BC, the Western Canadian province that’s home to Whistler, Sun Peaks and a dozen other of the world’s best ski resorts, the activity providers have to do things XL, better than all the rest. Anyway, the idea of going to BC last Easter on a family road trip and not skiing was pure madness, obviously, but it was a challenge I was up for (well, so long as it didn’t matter if I sneakily broke the “no ski” rule). Eight time zones west of the UK, Vancouver is probably not top of the list for most Brits’ weekend city break, yet when you are travelling across the Atlantic and across North America for your holiday, why wouldn’t you at least spend a few days in one of the world’s most vibrant cities before heading into the mountains? We made the smart move of starting our trip by staying at the Fairmont Vancouver Airport. Going so far and not leaving the airport on arrival may seem a little mad, but it was wonderful to collect our cases off the carousel, push them a short distance through the airy terminal and hand them to a concierge as we checked in and headed to the restaurant. It’s an oasis of quality and calm, and relaxing on arrival seemed much smarter than joining the car rental queue or taking a cab to a more distant hotel. The big guest rooms, spa, great staff and many other positives mean it was no surprise to read that the hotel has been voted the best in any North American airport for five years straight. Once we’d fully recovered from the travel and adjusted to the time zone difference we headed into downtown Vancouver early (the upside of the jetlag is you’re raring to go at 5am!) . 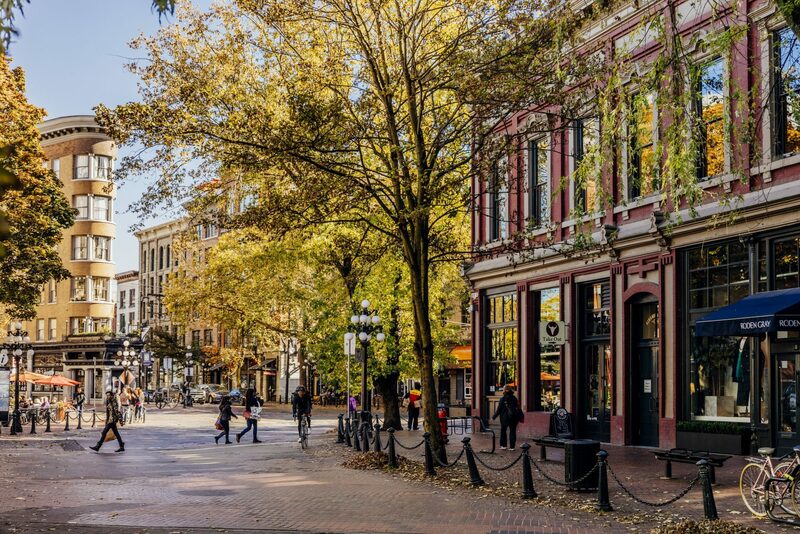 First stop were the cobblestone streets of Gastown, the city’s most historic neighbourhood now lined with enticing cafés and boutiques. Next we took the 40-second elevator ride up the 168.6m-high Vancouver Lookout tower for 360° views of the city before heading down to Spokes bike rentals, which was just clocking up 80 years in business. We hired our bikes and headed off for a ride around the 8km-long Stanley Park Seawall, a popular excursion providing more great views back towards the city and of the city’s forest meeting the ocean. The park’s many attractions include the city’s aquarium. Back in the heart of the city our final stop before heading north was Granville Island, a buzzing arts and cultural hub that’s also home to a famous public market and is accessed by the free False Creek Ferry. It takes about an hour and 40 minutes on the famous Sea-to-Sky Highway, upgraded ahead of the 2010 Olympics, to reach Whistler from Vancouver. We were booked in to the wonderful Fairmont Chateau Whistler, which is a resort in its own right with great restaurants, shopping and a swimming pool and spa. We could rent our ski gear in the hotel and board the lift steps from the rental shop – the only problem was the weather wasn’t too good on our arrival day; a full-on blizzard was blowing. 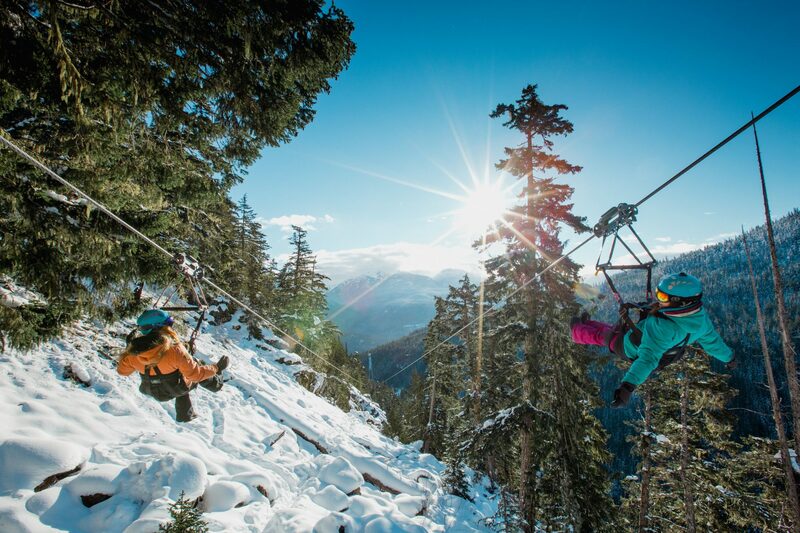 The highlight of our 48 hours’ not skiing in Whistler was undoubtedly the zip lining. There are a couple of companies operating in the resort, but we opted for Superfly, who for once aren’t exaggerating when they claim the world’s most spectacular zip line. Nerves aren’t completely allayed by the comprehensive induction and safety demo before you set off, and the custom 4×4 over snow ascent to the start of the first parallel cables – the ends of which disappear in the mist across the valley – doesn’t ease the fear either; it feels a bit like the car being ratcheted up the track at the start of a roller coaster ride. But then the sheer joy as you fly out on some of the world’s highest (nearly 200m above the ground) and longest wires travelling at speeds of up to 100kph feels very special indeed. I first visited what is today Canada’s second biggest ski area around 15 years ago and was delighted to see that while Sun Peaks has certainly grown in the intervening years, both in the village and up on the slopes where there’s now 1,728 hectares of terrain available, it remains a wonderful family-friendly resort with a compact centre, beautifully designed so that everything you need is steps from your hotel-room door. If anything, the sense of community here is ever stronger with a school opening on the slopes (the village kids take a carpet lift up to the door in the morning and can ski out of the door at the end of the day – how cool is that?). It was a fabulous drive over from Whistler through spectacular scenery, which is really what a visit to BC is all about. As we were visiting at Easter the road north and east from Whistler inland to Sun Peaks was snow-free, and we just drove along gasping in awe at the stunning scenery around every turn. The conditions were sublime as we rolled into Sun Peaks, which was just recovering from its second Snowbombing festival, and there were various dazed-looking folk wandering around the aftermath. They weren’t skiing though, and it would have been a crime to miss it. So we didn’t. The first non-ski activity we tried out, however, was a groomer ride-along. This is not so much a scenic tour (although it is that as well), but the chance to sit in with one of the team whose job it is to smooth the slopes each evening and night ready for the next skiing day. We were picked up from the base lodge by a couple of piste-bashers (which was pretty special in itself) and headed up the mountain soon after the lifts had closed for the day. Suffice to say grooming a slope is not as easy as you might think, especially for a resort like Sun Peaks, which was the first resort in North America to be ISO 14001 registered to try to minimise its environmental impact way back in 2004, so every night’s grooming is meticulously planned for maximum efficiency. The ride-along sure was fun though. Next morning, our last before heading back to Vancouver and home, was dog-sledding time with Mountain Man Dog Sled Adventures, who offer a range of adventures including the 45-minute “Bucket List” tour and the 90-minute “Into the Wild” option. 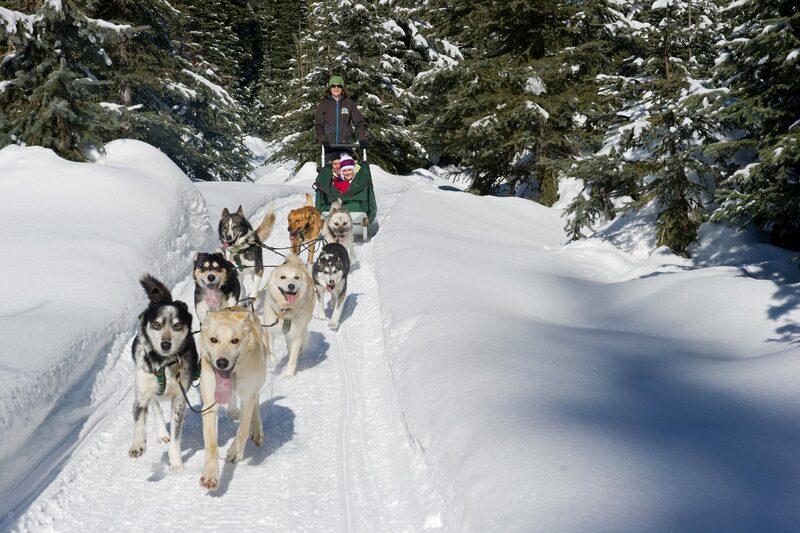 You have the choice of just riding along or taking a turn at being a “musher” yourself with expert instruction from the team. Dog sledding is always a wonderful way to explore the back country when you get the opportunity, and this was no exception and the perfect way to round off our BC-(almost)-No-Ski trip. 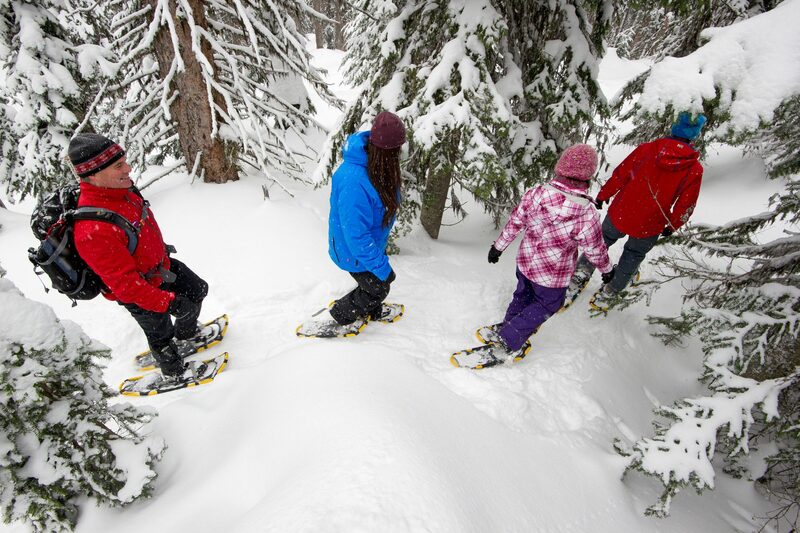 Had we had time we might also have tried snowmobiling, snowshoeing, ski biking, a sleigh ride or one of 101 other activities now available in Sun Peaks, Whistler and Vancouver – besides skiing or boarding that is. Alas we didn’t, but let’s just say I can confirm it is definitely possible to go on a winter holiday to BC, not ski (if you must) and still have a great time.